So today was no different. Somehow, the mail escaped unnoticed and unscathed from my children's attentions. However, pickin's were slim. A circular ad, a credit card agreement change and then one piece I didn't recognize. At first glance, I was ready to toss it. It listed me with my maiden name and then married name. The only place I have anything listed like that is on Facebook (all you married women know about that one...people from high school and earlier cannot find you if they don't know your new married name). So, my first response was to roll my eyes and start mentally ranting about Facebook and the privacy evils they have been dealing with. But my curiosity got the better of me and so I opened it and realized it was a newsletter from the missions organization I used to work at in Brussels, Belgium after I graduated from college. There were some familiar faces and some that were new. However, my eye locked on a quote that was set out from the rest of the copy....and it imploded my brain. The quote came from a visiting pastor from Burkina Faso who was working on a project with the media ministry. Here's what he said. 'He who beats the drum does not know how far it goes.'" Did it go as deeply within you as it did within me? There are so many ways to chew on this one. One of my first thoughts was about drum majors. I learned on Wikipedia (that great internet resource) that, "The drum major position is one of leadership, instruction, and group representation, but usually not administrative duties." Which sounds to me a lot like they get to dance around and jam, while bossing around the rest of the band. Plus, they were those really ornate uniforms with ample plumage on their hats. They bear all the pressure of making the band perform. If a misstep happens we all look to him/her in silent accusation. The more I thought about the drum beat in this way, the more it resonated with the type of person who is in a position of authority that informs their leadership -- like a president, a pastor, a police or fireman, a teacher or union boss. Although their direction in keeping the beat on track is necessary, we really expect them to do so. After all, it's the nature of their vocation. So I mentally scratched that picture and my mind centered in on the lone person playing a solitary jimbay drum. If you've never heard one played, you're missing out. The nuances in the sound that is achieved by the minutest of changes in the hand position and placement is astounding. My mind started pitting the cacophony of the entire drum section of a marching band against that solitary drummer. Truly, one would drown out the other. 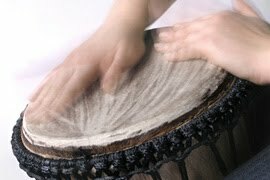 But, that one little drum by itself can pierce the quiet and bring about warning, a portent of something to come, a call to prayer, invitation to a celebration, or just express the emotions of its player. Do you ever feel like that lone drum player? I don't suppose that anyone out there ever gets tired of doing good -- especially when it seems to go unappreciated -- and worse, when it's an object of scorn. And truly, working hard to not lose your temper with your "problem-child" day in and day out does not seem to stack up to doing relief work in Haiti. Resisting the urge to gun your engine to cut off the crazy driver who cut in front of you a few minutes ago (flashing your Not of This World decal in their proverbial face nonetheless) might not seem like much of an accomplishment...you know when you think about the person who is hungry but still refuses to steal. But I truly think it's these "little" good things that we choose to do -- day in and day out -- that define us. After all, it's easy to beat that drum when people are looking at us in anticipation. It's like it's our duty. But, when no one is watching at all? That's when the true beat of our heart shows itself. And yes, we can't know how far that drumbeat will travel. The person we choose not to retaliate against in the fast lane, might go home and carry that grace forward to their family members. That "problem-child" might one day grow up to be a relief worker in Haiti. We just don't know the full affect of our actions. So, be encouraged to keep on beating that drum...someone may actually really need to hear it.